Oct. 19: After Romney Gains, Should Obama Concede Florida? The national tracking polls on Friday showed some improvement for President Obama. He made gains in the surveys published by Rasmussen Reports, Investors’ Business Daily, Gallup and Public Policy Polling, while losing ground only in the online survey published by the RAND Corporation. Both the favorable trend toward Mr. Obama in the Gallup poll and the unfavorable one for him in the RAND poll might be regarded as examples of reversion to the mean, since both polls had been outliers relative to the consensus. 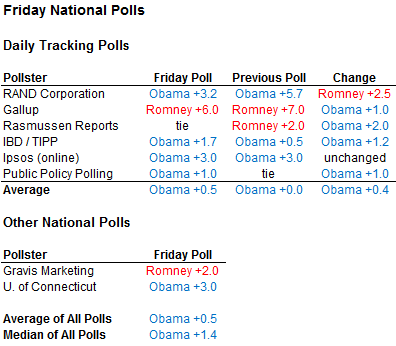 Still, it was among the better days of national polling for Mr. Obama since the Denver debate. On average between the six daily tracking polls and two other national surveys that were published on Friday, Mr. Obama held a nominal lead over Mitt Romney of one-half a percentage point. The median, which reduces the weight given to potential outliers, had Mr. Obama up by 1.4 percentage points instead. These figures are quite consistent with the FiveThirtyEight “now-cast,” which calculates the current standing in the national popular vote based on all national and state polls. That method estimates that Mr. Obama would win the national popular vote by 0.8 of a percentage point in an election held today. It was Mr. Romney, however, who made an overall gain in the FiveThirtyEight forecast on Friday. His chances of winning the Electoral College ticked up to 32.1 percent, from 29.6 percent on Thursday. Part of the reason is the sharp decline in the stock market on Friday, a component of the FiveThirtyEight economic index. The economic index receives fairly little overall weight in the forecast at this late point in the election, but a sharp move in one of its components can still move the numbers some. The more important factor, however, is that Mr. Romney had a fairly strong day in state-by-state surveys. 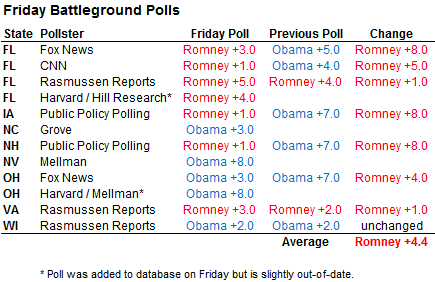 Mr. Romney led in 7 of the 12 polls from battleground states that we added to our database on Friday. Furthermore, he made clear gains relative to the previous edition of the same survey in several of the polls, which in most cases predated the Denver debate, improving his standing by 4.4 percentage points on average in polls that provided for a comparison. Especially on days with a heavy volume of state polling, they tend to predominate in the FiveThirtyEight forecast. Thus, just as in Thursday’s forecast, when Mr. Obama’s standing improved because of strong state polls despite middling national polls, the opposite was true for Mr. Romney on Friday. If you look at the table above, however, you may notice a more specific theme in the state polls. We added four Florida polls to the database on Friday, and Mr. Romney led in all of them, by margins ranging from one to five percentage points. The FiveThirtyEight forecast does not yet account for a fifth Florida poll, from SurveyUSA, which gave Mr. Obama a one-point lead there but was published overnight after we ran the forecast. Still, Florida has been polled so densely that the overall trend has become clear: Mr. Romney has made larger-than-average gains in the state since the Denver debate, and has now become a definitive favorite there. According to the FiveThirtyEight “now-cast” on Friday, Mr. Romney would be a 78 percent favorite to win Florida in an election held today. Projecting forward to Nov. 6 introduces a bit more uncertainty, but he’s now a 69 percent favorite to carry the state on Election Day, according to the model. Mr. Romney’s gains in Florida call into question how vigorously the campaigns should be contesting it over the final two weeks of the campaign. Mr. Romney might consider relaxing his efforts there, while Mr. Obama’s campaign might consider de-emphasizing the state. Based on the FiveThirtyEight tipping-point index, Florida is now only the ninth-most-important state in the Electoral College math. There is only about a 2 percent chance that the decisive Electoral College vote will be cast in that state on Nov. 6. This represents a significant decline: Florida had ranked as high as second on the tipping-point list at earlier stages of the race. Why is the forecast model so willing to dismiss Florida? It reflects a combination of Mr. Obama’s recent weakness in the polls there — and his comparative strength elsewhere. Mr. Obama remains the overall favorite in the FiveThirtyEight forecast because he leads by at least 1.8 percentage points in states with enough electoral votes for him to carry 277. The closest of these are Wisconsin, Ohio, Nevada and Iowa. Mr. Obama could afford to lose either Nevada or Iowa from his column, which would still leave him with 271 electoral votes — just enough to win. He could not afford to lose both Iowa and Nevada without adding other states to replace them. Nor could he afford to lose Wisconsin or Ohio. It’s still too soon — and there is still too much intrinsic uncertainty in the polling — to reduce the election down to these four states only. Two other states, Colorado and Virginia, were virtually tied in the FiveThirtyEight forecast as of Friday. These provide Mr. Obama with some additional flexibility, since Colorado contains 9 electoral votes and Virginia 13. If he carried both states, for example, along with Iowa and Nevada, Mr. Obama could afford to lose Ohio, Wisconsin and New Hampshire and would still win the Electoral College. pears to hold a lead now (Ohio, Wisconsin, Iowa and Nevada) — themselves sufficient to provide him with a winning electoral map — and the three others (New Hampshire, Colorado and Virginia) that are roughly tied but could serve as backup plans for him, his electoral strategy remains reasonably robust. The potential benefit of winning Florida is that it would allow Mr. Obama to circumvent the need to thread the needle quite so tightly. Ohio, for instance, is not quite a must-win state for Mr. Romney, in view of the forecast model. (Winning without Ohio would be difficult but not impossible for Mr. Romney; the same is true for Mr. Obama.) 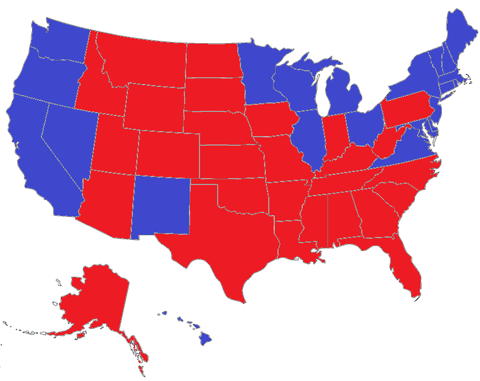 But Florida, with its 29 electoral votes, is very much a must-win for Mr. Romney. If winning Florida represents a high-upside case for Mr. Obama, however, it also comes at considerable expense. Florida, because of its large population, is an expensive state to advertise in. And it is a state that probably does require a considerable advertising expenditure. Florida’s population is large, but not especially dense, spread out in a number of exurban and suburban communities throughout the state. It’s easier to reach voters through the airwaves there than by knocking on doors or appearing at campaign rallies. Finally, Florida is a state in which Mr. Obama has always been swimming upstream, since it is traditionally a bit Republican-leaning and since its economy remains weaker than those of the battleground states of the Midwest. The “state fundamentals” calculation that the FiveThirtyEight forecast considers along with the polls, which projects results based on each state’s past voting history, demographics, economic conditions and fund-raising totals there, estimates that the most natural result would be a win for Mr. Romney by three percentage points. Florida also has a history of fairly accurate polling; it is not a state, like New Hampshire or Nevada, that is known for producing Election Day surprises. All of this should call into question whether Florida represents a wise use of resources for Mr. Obama. The same is partially true for Mr. Romney, although the situation is not quite symmetrical. If Mr. Romney were to disarm there first, while Mr. Obama’s campaign continued to contest the state, Mr. Obama might improve the numbers enough to bring it closer to the national averages and improve the state’s ranking on the tipping-point list. If the reverse were true — and Mr. Romney kept pouring resources into the state while Mr. Obama did not — it would presumably go from somewhat Republican-leaning to being even more strongly in Mr. Romney’s column, but would not pass through the electoral tipping point. Still, if the recent polls and the FiveThirtyEight forecast are right, Mr. Obama’s efforts to compete in Florida mostly serve the function of a bluff. They might be enough to prevent Mr. Romney from taking the state for granted, but that doesn’t necessarily mean that Florida will be central to the electoral math on Nov. 6. There is an interesting counterpart to Florida in the form of Pennsylvania. Pennsylvania is another state in which Mr. Romney seems to have made above-average gains since the Denver debate. Still, the FiveThirtyEight forecast, and the consensus of polls in the state, put Mr. Obama about four points ahead there. Mr. Obama is more likely to win Florida than Mr. Romney is to win Pennsylvania. And yet, Pennsylvania now ranks ahead of Florida on the FiveThirtyEight tipping-point list. It has a 6 percent chance of providing the decisive electoral vote, according to the model, against just a 2 percent chance for Florida. The reason that the forecast model views Pennsylvania as being more important than Florida is slightly more subtle than this, however. Both states offer high upside for the candidates. But Mr. Romney has more incentive to pursue the high-risk path in Pennsylvania because his alternatives are worse, meaning that his opportunity costs are lower. Mr. Romney certainly doesn’t need Pennsylvania to win the election, but going for broke there is arguably a better strategy for him than having to pick off four or five states where they are now tied or where Mr. Obama holds a small lead. Mr. Obama, conversely, just needs to hold his ground in those same states. Trying to pull Florida back into his column would represent a heavier lift — and probably an inferior strategy given the recent polls there.